Servus, welcome to the Bavarian oktoberfest band Bergvagabunden in Germany. We play typical bavarian and tyrolian music – either as function band or as show act. Enjoy our german themed entertainment for events like beerfest (bierfest), maifest (mayfest), oktoberfest (of course! ), private & corporate, incentive, fair or conference. You can book us as a two/three/four piece beer band, amplified as well as unplugged (walk act with roaming performance). As a professional oom pah band we play nation and world wide, e.g. ✓ all over Asia: Hong Kong (Hongkong / 香港), Singapore, Cambodia (Phnom Penh), Thailand (Bangkok), Malaysia (Kuala Lumpur) etc. Many local and international agencies and companies trust our show band Bergvagabunden with our german live music entertainment as a reliable and professional partner for events all over the world. Maybe we are the only oktoberfest oom pah bavarian band based in Germany that sings as well in spanish, portuguese, italian, french, dutch, turkish, arabic and russian – but no chinese (yet). We speak englisch and french fluently. How many musicians would you need in Berlin, Munich, Frankfurt or Dusseldorf? The number of musicians depends on your budget and the number of guests. One musician would be absolutely sufficient for an audience of a 100 people, but way to little for 1.000, in this case you better choose three or four, maybe including one female singer, a beautiful German fräulein? But how could just a single musician sound like a band? Pretty simple: the accordion is equipped with a so called midi system by Limex, which enables your Bergvagabund to play different instruments incl. bass, drums, guitar and accordion the same time – plus a little help of an ipad. You can book the bavarian oktoberfest band Bergvagabunden from Germany as an entertainment agency in Frankfurt – Germany for dinner entertainment in Dusseldorf, events entertainment in Berlin or with corporate entertainment in Munich. This beer band plays as well as a german / bavarian oktoberfest band in Dublin, London, Amsterdam, Brussels or Paris – maybe by far the most flexible event entertainers. What price do you have to expect for jobs outside Germany? First you need to be aware of travel costs. Flights should be direct flights from Frankfurt, Brussel, Amsterdam or Dusseldorf. Economy class is okay for day time flights, night flights require business class. Plus there are costs for bulky luggage and maybe visa. You would have to take care of private (no public) transportation in your country, hotel (single rooms *****), f&b, sound system with technician. The artists fee depends on the number of dates and the month (September and October we are already extremely busy here in Germany), plus the number of travel dates. For example requires a November’s Monday in Hurghada two days of traveling, so in total three days, here for you should expect for one musician at least € 2.000 plus 7% VAT, to be paid in advance, prior the event. Further questions? Do not hesitate to contact your bierfest and oktoberfest band Bergvagabunden now! Do you need a walkabout band for your Germanfest or Beerfest? The band “Bergvagabunden” performs as a mobile and walkabout band for a Germanfest or Beerfest all over in Germany. With accordion, baritone and trumpet or guitar the guys would love to entertain your private or corporate events in Berlin or Munich (and elsewhere in Bavaria or Tyrol). Enjoy Bavarian music, make your guests happy, hire the Bergvagabunden walkabout band. Find more about our entertainment agency in Germany for your corporate events in cities like Berlin, Frankfurt or Munich (here …). Like and follow “Bergvagabunden” at facebook as well! People love Bavarian show acts and marching band as beer festival and Oktoberfest entertainment, and this is what Bergvagabunden provide. So if you need Bavarian entertainment or music from Tyrol as Beerfest or Oktoberfest show acts, www.bergvagabunden.com is the right choice. Customers love the awesome variety and repertoire! International charts, alpine songs, Germanfest hymns, slow and fast – it’s all possible. A perfect Bavarian live band for hire – maybe as gala dinner entertainment in Germany? A German folk music band needs an accordion and brass instruments like baritone or trumpet. Folk bands in Germany play songs of the old days, like Mein Vater war ein Wandersmann or Muss i denn zum Staedtele hinaus, which was made famous by Elvis’ version called Wooden heart. Folk music in Germany does not include the Chicken dance, because it is an instrumental from the 1980s made famous by a Dutch band. If you do not want to book the Bergvagabunden as a function band you can hire them as a typical and breath taking show act that enters the stage and blows the audience away with its powerful sound and animation. So if you come to Germany and need a show act with folk music – with yodeling – this band is a good choice. Why trust Bergvagabunden entertainment as live Bavarian & German party band? There are many german bands from Berlin to Munich or oompah bands that are to book or hire as live Bavarian band e.g. for wedding celebration in St. Moritz and party entertainment, and there are many entertainment agencies all over Germany – so why us, why Bergvagabunden as German party band? Since many years our band and entertainment agency is specialized in corporate event entertainment with Oktoberfest music and Bavarian music, for example in Kuala Lumpur. Our corporate entertainers provide great event entertainment with Oktoberfest themed entertainment, like the world famous lederhosen dance and a great live party band including an accordionist and a beautiful female singer with traditional Bavarian music- and more! Because the Bergvagabunden party musicians play lots of charts as well at Oktoberfest parties in Switzerland, especially as Oktoberfest themed entertainment in Zurich and as oom pah band with traditional Bavarian dancers in Basel. Bergvagabunden: a Oktoberfest Band Munich that you can hire for any private or corporate event, with Bavarian folklore Munich, including the famous duck dance or chicken dance. Probably your next convention is a Oktoberfest celebration in Thailand Bangkok or a beer festival in Cambodia Phnom Penh – then you will need a decent Oktoberfest band, and a showcase with genuine Oktoberfest entertainers. Our band is a professional event supplier in Malaysia with typical Bavarian event activities, like Masskrugstemmen! And we are both: a modern German party band on the one hand and an old school Oberkrainer brass Band playing songs of Slavko Avsenik on the other even in Asia with places like Hong Kong and Singapore. We hope our website gives you an idea of the many various options we offer our clients. Some will be booking us as a Bavarian showband from Germany in Oman Muscat, other want to hire us as a Bavarian party band with Bavarian entertainment in Egypt Hurghada. Our genuine Bavarian show, our work as a Bavarian strolling band makes us suitable for first class events in five star hotels in Bahrain – Manama as well as polo or jockey clubs in Abu Dhabi or Dubai. 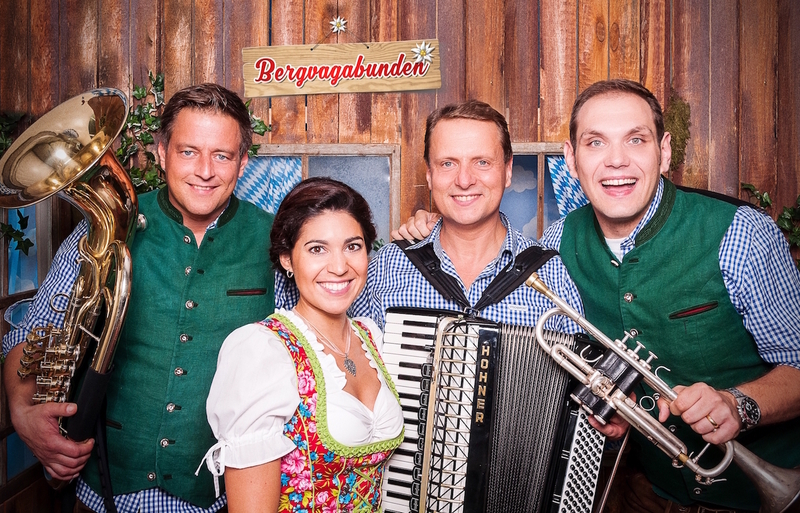 From Stuttgart to Umm al-Quwain, from Frankfurt to Qatar Doha: Bergvagabunden will make you and your guests very happy with tyrolian and bavarian (german) entertainment. We will come as suppliers and we will leave as friends – at any events, especially as gala dinner entertainment. Just follow us on YouTube and facebook, and test us as band and agency. And we are flexible and even in a short notice would come to your venue. To places like Dusseldorf and Liechtenstein / Vaduz e.g. for a German fest we come by car, for other places like Dublin and Dubai we need to fly, where as we might be able to come for a Beer fest in London by car, bringing our own sound & light system (at least if it is pre-Brexit). So what are you waiting for? Send uns an email, or talk to us via skype/facetime/phone – we look forward to receive your message. Thank you for reading our descriptions, we really hope they helped you to find what you are looking for. Thank you for visiting our site www.bergvagabunden.com, where you find corporate entertainment Germany of our Bavarian Oktoberfest band for your events.